All the products introduced in this series were Nikon's cameras. This time I wish to take it up as it is associated with my old memories, though it is not much related with a camera itself. The news photograph which Nikon is closely related with was taken up in Part 16. Nikon Still Video Camera "QV-1000C" (1988). As mentioned there, the news (press) photograph is in the more severe competition than we imagine. Regarding ordinary daily newspapers, their full circulation is not printed at a time, but printed in several "editions". For areas far from the printing works, newspapers of the earlier editions are delivered as it takes time for transportation, and for areas near the printing works, the later editions are delivered. In a report of an event just before the closing time, it is the point of the issue that in which edition the new article can be published. In order to publish it in as early edition as possible, they are struggling with a minute or a second, without exaggeration. Then, the name of the game is "how to transmit a photograph ?" At the time of 1981, character information could be sent by telephone or facsimile. The transmission of a photo took the time most, and it was the biggest problem for newspaper companies and news agencies to shorten this time. The idea of "transmitting from a negative direct"
Under such circumstances, it was around 1981 that I met with Mr. K of Photo Dept. of Kyodo News. When I visited Mr. K at Kyodo News together with a few staff members of Camera Development Dept., and the idea came out when we were chatting over a cup of coffee in a basement tearoom. Mr. K told us that he had expectation on electronic still video camera like the "MAVICA" of SONY Corporation that had just been released, but I explained to him that "the image quality of this type of camera doesn't reach the level acceptable for news photos", and "it may take much time before such an electronic camera as "MAVICA" can be practically used". Then he said, "Before an electronic camera can be practically usable, isn't it possible to read the image directly from the negative before making a print and transmit it ?" It saves much labor and time to omit the printing process. The topic didn't develop any more since Nippon Kogaku K.K. was not originally engaged in the photo transmitter business at that time, but it was kept in my mind as an idea worth studying more as I was in charge of research and study in the theme of "electronization of photo system". After I returned to the office, I studied more about the periphery of the idea and its feasibility. In the photo transmitter of that time, a printed photo was wound round the drum and was rotated and scanned by the head consisting of illumination lamp and photo-multiplier combined which was moved parallel to the rotation axle of the drum. To take in the image information of negative film, it needs much labor and time, if a film strip cut in every four or six frames which is the usual handling form is wound round the drum. However, the CCD line sensor reached the level for practical use. It is used for the transmitter of a facsimile and one line of image information corresponding to several hundred to several thousand pixels is converted to electric signal. As the signal of only one line is taken, entire frame is scanned by moving the material or the sensor itself. Can this line sensor be used successfully ? Fortunately, the length of line sensor is close to the size of shorter side of 35 mm (135) film format. Then, almost 1:1 optical system is to be formed in combination of a Nikon SLR camera body, Micro Nikkor lens and bellows attachment. Slide copy adapter is arranged in front of the lens and the image of the negative film is focused and that focal plane is to be scanned by moving the line sensor......Well, this may be all right ! I made a rough drawing and proposed to the General Manager (head of department) of Planning Department of Camera Division. After explaining the principle, I mentioned about the effect, "It will be a larger merit for the news field that uses cameras of Nikon and it helps the sales promotion of SLR cameras to newspaper companies". The General Manager of Planning Department who was listening to my explanation without saying any word so far, uttered a word, "OK, let's go." The development started with a quick decision, in spite of a completely new development. Though the development was decided to start, we encountered so may obstacles after that. A team was organized by mechanical and electrical engineers picked up from Camera Designing Department but it was an unknown new technical field. To our request to Kyodo News via Mr. K of Photo Department for their support, they kindly accepted it and their staff members related to photo transmission provided us with various technical information. There were so many things to be cleared to send a sheet of photograph via a telephone line; about telecommunication line, communication protocol, method of modulation, method of synchronization, and so on. Everything was indeed a lesson to us (everyday). In spite of close investigation, a lens that fits for use with the equipment was not found among existing lenses, and a new lens was to be designed. The new lens was decided to be a zoom lens in consideration of a 135 format negative being scanned trimmed. The illumination system, film holder, moving mechanism for line sensor, signal processing circuit were added to that and the prototype was displayed at the meeting of Kyodo News and its associate member newspaper in 1982. There we saw the reaction of newspapers that will be users-to-be, and stepped to the next stage. The first prototype was made to the final product with a slight improvement added to the hand-written caption superimposing mechanism, and we released it as "35 mm Direct Transmitter NT-1000" (Photo 1.) in 1983. This Direct Transmitter brought about a "revolution" in the Japanese press world. to that time, if an event happens at a remote place, a pair of a photographer and a transmitter operator go to the spot, and the photographer sets up an instant dark room there and must make prints with operating the enlarger. If "it's possible to transmit from a negative", a film developing tank and a dark bag alone are required to carry. In addition, as the photographer can operate the Direct Transmitter, it is not necessary to send a transmitter operator. This leads to the much reduction of man-power, cost and time. Japanese newspapers adopted this "NT-1000" one after another. Not content with our success, we tried to export it to overseas market as the next stage, but things don't go so easy. There were rivals who realized the similar idea in the States and Europe and they have already acquired some market share. Further, it was required to obtain a license coping with the different communication protocol and the safety standard for each of those market places, we were obliged to undergo all sorts of hardships everywhere. After all, only a certain quantity was shipped to northern Europe owing to the effort of sales staff of European subsidiary. The news field at that period was just in the midst of technological innovation. The printing method was switched over from letterpress to offset and color pages in the newspaper increased rapidly. In response to that movement, "35 mm Color Film Scanner / Direct Transmitter NT-2000" capable of color processing (Photo 2.) was released. 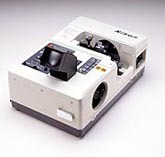 "NT-2000" had the color separation function by means of a dichroic prism and a color CRT display was built in for monitoring the image to transmit. It was just the high-tech itself and I had the impression of "large and heavy". And the more practical, slimmed-down version of "NT-2000" was the "NT-3000" released in 1993 (Photo 3.). The monitor display of it was changed to LCD type and the color separation was made by the change-over of filters instead of dichroic prism. The most distinctly featured "NT-3000" was, above all, that circuit boards of each block were inserted to slots like an interface board of a personal computer. The world was promptly shifting from "analog" to "digital". In the world of transmission of news photo, the shift from former analog transmission to digital transmission was just on the way. To cope with that shift, "NT-3000" facilitated to catch up with the new technology just by replacing the boards. This is similar to "Nikon F" that kept adopting new exposure metering techniques one after another by means of "Photomic" series finder exchange system. This system was well accepted by users, the press people and "NT-3000" was the best selling news photo transmitter. 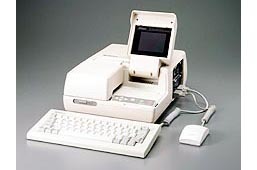 However, this "NT-3000" finished its role around 1997 and retired from the first line of the news reporting. As the time had changed to photo transmission by means of personal computer, and digital cameras were also practically usable, the stand-alone direct transmitter was obsolete. Nevertheless, the experience relating to the photographic image handling cultivated through these direct transmitters remained in Nikon as know-how and still serves well for the development of subsequent film scanners and digital cameras.